Oyster mushrooms have been used for thousands of years as a culinary and medicinal ingredient. The white mushrooms resemble oysters, and can be found growing in the wild on dead trees or fallen logs. They have a rich history in traditional Chinese medicine from as early as 3,000 years ago, particularly as a tonic for the immune system, according to acupuncturist Christopher Hobbs, author of "Medicinal Mushrooms." Oyster mushrooms contain ergothioneine, a unique antioxidant exclusively produced by fungi, according to a 2010 study led by Penn State food scientist Joy Dubost. 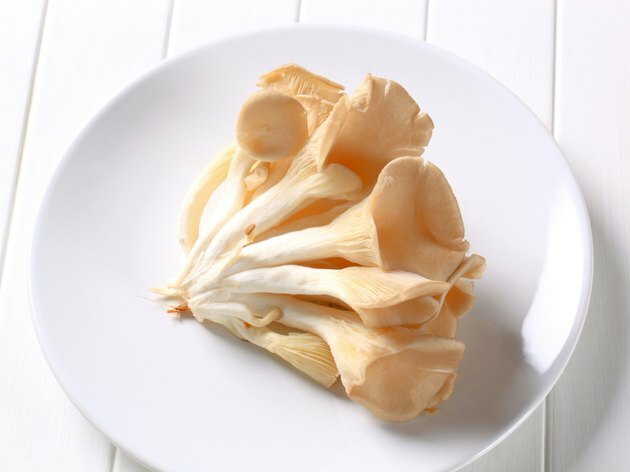 The study found that oyster mushrooms have significant antioxidant properties that protect cells in the body. A 3 oz. serving of oyster mushrooms contains 13 milligrams of ergothioneine, and cooking the mushrooms does not reduce this level. Oyster mushrooms have significant antibacterial activity, according to a 1997 study published in the "Journal of Agricultural and Food Chemistry." The study found that the active compound benzaldehyde reduces bacterial levels. It may form on the mushroom as a reaction to stress. There are 42 calories in one cup of oyster mushrooms, making them a low-calorie addition to any meal. Oyster mushrooms are also high in nutrients. According to a study published in "Food Chemistry," oyster mushrooms contain significant levels of zinc, iron, potassium, calcium, phosphorus, vitamin C, folic acid, niacin, and vitamins B-1 and B-2. The study concluded that consuming oyster mushrooms as part of a healthy diet contributes to recommended nutritional requirements.